South County Roofing can help maintain and keep your roof from leaking by providing quality roof repair and maintenance to your roof. If you suspect you have any broken tiles on your roof you should call us for an honest evaluation of your roof. We will only recommend what your roof needs and nothing more. There's no hard up sell and no pressure with us. It is always a good idea to have South County Roofing look over your roof and make sure nothing needs to be done to prevent expensive roof leaks before the rainy season. Having us inspect your roof could save you costly roof repairs when it starts raining. Our roof repair technicians are trained to find small repairs that if done correctly will save you from costly roof leaks. South County Roofing is completely licensed, bended and insured with Workers Compensation and 2 Million Dollar General Liability insurance. Laguna Niguel residents can count on us for a licensed and insured roofing contractor with great prices. Laguna Niguel homes are mostly roofed with standard weight concrete roofing tiles. Standard weight tiles have three basic profiles: flat, "S", and low profile curve that looks like many small humps across the roof. The types of roofing tiles used are mostly cement roofing tiles in both the flat and curved versions. No matter what type of tile roofing you have we work on it and we are very experienced at working on all types of tile roofs. No matter what type of roofing tiles you have on your roof we can properly replace them without causing roof leaks. We take this small job very seriously. We always remove the debris as opposed to breaking up the removed tile and stuffing it under your roof. Yes, believe it or not people do this all the time. 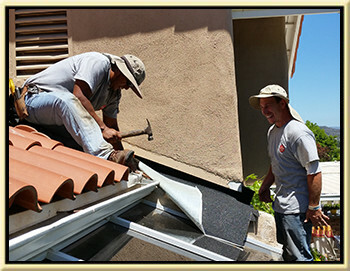 South County Roofing employees are trained to check and hand sweep the felt paper under the removed tile to ensure it has not been comprised. And the nail hole left when we remove the fastener is always carefully sealed up and we use a tile adhesive to adhere the replacement tile in place. If all of the steps are not done correctly you roof will leak as a directly result of faulty workmanship. Call South County Roofing to repair or replace your broken or cracked roofing tiles in Laguna Niguel and these areas: Dana Point, Portola Hills, Ladera Ranch, Trabuco, Laguna Hills, Aliso Viejo, and Mission Viejo.